Home Fact-Check Prasar Bharati Chairman vs Smriti Irani: Does this controversial consultant have a role to play? There has been a lot of chatter about the ongoing “war” between the Information and Broadcasting Minister Smriti Irani and the Prasar Bharati Chairman, Surya Prakash. Many have speculated about what the possible reasons for this “war” could be. Was it ideological? Was it because as many from the opposition say, Smriti Irani is an incorrigible control freak who won’t let anyone else run the show as they deem fit? Or are the reasons hidden? Carefully hidden in plain sight? OpIndia accessed some documents from its sources in the Information and Broadcasting Ministry that tell a very different tale. But before we get into that, we must back up a little and take a trip down memory road. To a sting operation called “Operation Prime Minister” that was conducted in late February 2014. In the sting operation, it was revealed that some opinion poll agencies were allegedly willing to fudge the data for money, to favour candidates and political parties. Shocking as it was, some big agencies were also involved in this sting operation. One person, however, is of relevance to today’s article. Kishore Kumar Malviya. Newszstreet Digital Media Pvt Ltd said they receive black money for opinion polls. ‘We received only Rs 12 lakh by cheque, rest of the Rs 12 crores was received as cash which was black money,’ said Kishore Malviya, a consultant of the company. Kishor Kumar Malviya was also caught on tape contemplating how the numbers should be fudged just enough to make it seem “believable”. Such a person who was allegedly caught on camera accepting that he takes cash to manipulate polls in favour of political parties and candidates, was for some reason, eventually found in the employment of Prasar Bharti. We accessed a document which proved that Kishore Kumar Malviya was hired as a consultant in Prasar Bharati. He was not only hired as a consultant but also made the Creative Head of DD Kisan on 8th of December 2014. This is a good 10 months after the sting operation surfaced. Interestingly, Malviya’s contract was terminated only on 8th December 2017. We also accessed an Office Memorandum (OM) where it is clearly stated that the so-called “consultants” were imposing their decisions on officers and there were complaints regarding the same. The Memorandum also details how consultants close to the Chairman have been misusing their proximity to the Chairman. The most interesting part is that even though Kishore Kumar Malviya’s contract got terminated on the 8th of December 2017, we have been informed that the Chairman, Surya Prakash, allegedly didn’t want to let go of Malviya and he continued to work. The above office memorandum was in connection with the same, detailing why Malviya and the remaining consultants could not be retained. 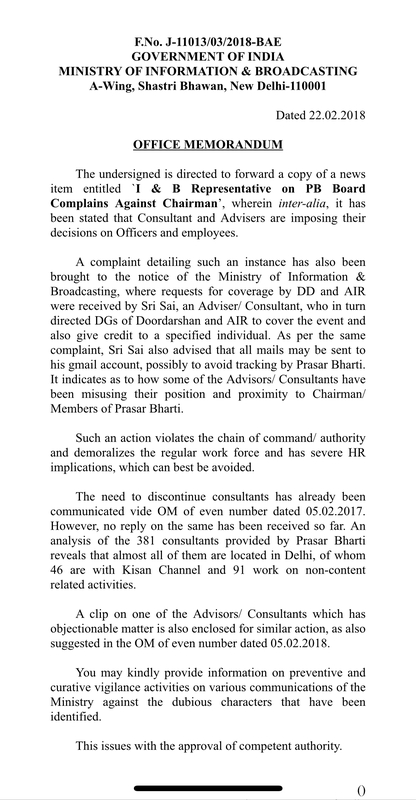 The OM clearly states that the need to terminate the contracts of consultants was communicated by the Ministry on 5th February 2017 and Prasar Bharati did not respond to the same. There were 381 consultants and Malviya was one of them. 46 of these consultants were with Kisan DD, of which Malviya was the creative head. In fact, the OM also talks about the ‘clip of one of the consultants that have objectionable matter’. We have been told that this reference to the sting video that featured Kishore Kumar Malviya, allegedly fixing opinion polls. Incidentally, the leftist propaganda website came up with an article blaming the I&B ministry for not releasing funds owing to which, Prasar Bharati had to dig into its contingency funds. The I&B Ministry issued a clarification stating that for the release of funds, a MoU has to be signed, and despite repeated reminders, Prasar Bharti had not signed the said MoU. The question thus arises if this ongoing “war” between Minister Smriti Irani and Prasar Bharat Chairman is owing to this cleansing of tainted consultants? Is it also because the Minister is putting a stop to the financial drain that these consultants come with? Is it because Minister Smriti Irani took action, or sought to take action against the consultants who were misusing their proximity to the Chairman Surya Prakash? These questions will perhaps remain unanswered till either the Minister or the Chairman come out in the open and either confirm or deny this hypothesis. Till then, we can perhaps only hope that Minister Smriti Irani succeeds in cleaning up the system. Note: We emailed Mr Surya Prakash a set of questions to be answered regarding this story. We will update this article with his replies when he responds.